Do-it-yourself mobile website design is possible considering the abundance of easy-to-access resources including books, video tutorials, and step-by-step instructions. It must be said, nonetheless, that the results of amateur efforts cannot compare with the results delivered by seasoned mobile web development professionals for obvious reasons including formal education, training and work experience. 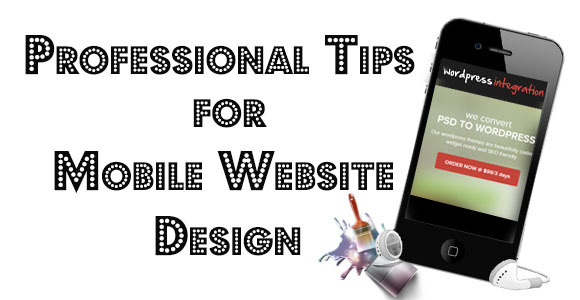 Still, you will benefit from the knowledge about the following professional tips for mobile web-optimised design. Keep in mind that mobile web design will differ when these factors are considered. For example, if you are designing for both iPhones and tablets, you must consider full functionality in both devices. You must use analytics and market research to determine what device to focus on and what measures to take in order to cater to mobile website usage patterns. Keep the core content between the mobile and desktop website the same for better experience but make sure that switching between the two formats is easy. Never compromise on the brand image and ensure that if the client uses a blue logo on their traditional website, then that is also followed through onto the mobile platform to maintain uniformity. Note that you are not copying and pasting your website to your mobile device. You need to create just a few pages; your most important pages – This does not include your profile page or company profile page. In my personal experience, clients are keener to showcase their most popular services and by targeting what consumers are looking for, the chances are significantly higher for someone to contact you and enquire and book your service. Keep in mind that the size of the screen and the keyboard panels on mobile devices are smaller than on desktops. The display including the font styles and sizes as well as icons, tabs and buttons must be optimised for fat fingers on small keys. Touchscreen technology should always be considered especially as most mobile devices are now on it. Keep the display as clean as possible. Too many images on the screen can clutter the display and, thus, discourage the viewer from proceeding deeper into the inner pages. Define your grid and breakpoints, too, so that your design is responsive. Yes, it is important to keep white spaces. Keep to the UI guidelines. Each operating system on smart phones (i.e., Android and iOS) is different and, thus, you must design for such differences while also considering backwards compatibility and fragmentation. Your target customers will then have an easier time using the apps. What are mobile users really searching for? By now you would understand that creating a mobile website requires more innovation and creativity than a traditional website. Therefore, it is essential to make sure that you understand the client requirements and find out the exact outcome they are want to achieve and at the same time being aware of the guidelines to follow as the above. Ensure in discussions with your clients if there is something very specific that is searched for in their trade/industry and ensure that is incorporated in the design process. Indeed, mobile website design can make or break your business in the market – entrust it to the professionals. Author Bio:Hemina Shah is an internet marketing specialist at Shivam Technologies – a professional software development company based in Melbourne, Australia. She has been helping clients with content writing and her areas of speciality include mobile website design. She loves exploring the outdoors and taking long road trips to places she has never been before when she isn’t working.Visit Author Website.